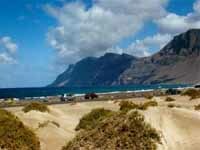 The most northeasterly of the Canary Islands, Lanzarote has embraced the tourism boom with a more laid-back feel than its popular sister islands of Tenerife and Gran Canaria. Nature is still the biggest attraction on this small volcanic island, which measures only 38 miles (60km) in length and 13 miles (21km) across at its widest point. Lanzarote's beaches are varied and dramatic, including long stretches of golden sand, some good surf spots, and some rugged, hidden coves. Camels are often used to transport goods (and sometimes tourists) on this desert-like island, across the dry volcanic ash that covers most of the landscape. UNESCO declared the whole island a Biosphere Reserve in 1993, and visitors exploring the dozens of enchanting and unique spots on the island will soon see why. Lanzarote's capital, Arrecife, is a small town on the eastern coast, its harbour packed with fishing boats. Although the town itself has little to offer in the way of sights or nightlife, it does have a magnificent beach, El Reducto, which has been granted blue flag status by the European Union. A promenade runs along the beachfront around the San Gines lagoon with its fine golden sand and placid waters. Like the rest of the Canary Islands, Lanzarote offers visitors duty-free shopping, and there is a fun nightlife at the Puerto del Carmen resort.